When Indiana Jones returns to theaters in 2019, 30 years will have passed since we last saw him... is what you may be thinking today, assuming you’re one of the many people who deny Harrison Ford and Steven Spielberg returned to the franchise in 2008 with Kingdom of the Crystal Skull. But now that a fifth movie is on its way, it’s time to take another look. The film was a massive hit, grossing over $315 million in the U.S. and almost $800 million worldwide. Everyone saw it but, in the years since, it has seemingly escaped the memories of many fans. Goodwill for the film at release has steadily declined over the years (although it’s still “Fresh” on Rotten Tomatoes) to the point where it’s not uncommon for people to joke that it never happened. But it happened. Spielberg and Ford not only nuked a fridge, they introduced that Jones had a son named Mutt, brought back Marion and watched a giant spaceship come out of the ground. Yes, Indiana Jones now knows aliens exist. Some of what occurred in the film can be avoided when Indiana Jones 5 happens, but a few things cannot. 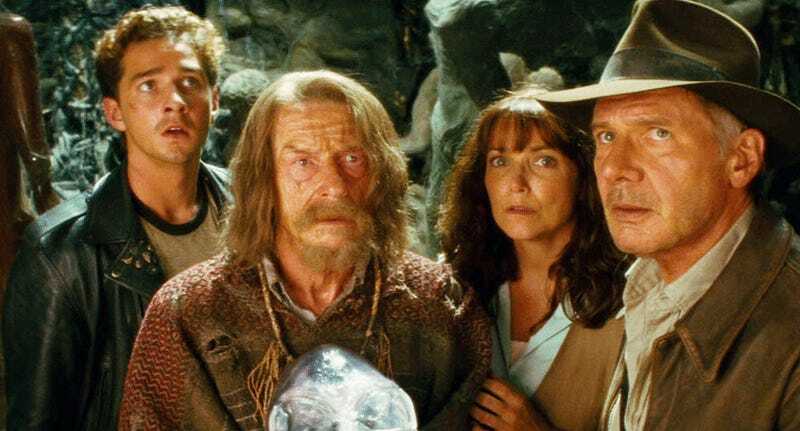 Crystal Skull ended with Jones marrying Marion, something fans had thought about since Raiders of the Lost Ark in 1981, and almost—but not quite—passing his fedora to their son. When Indy 5 hits theaters, it’ll be mere days after Harrison Ford’s 77th birthday. That’s a pretty advanced age for an action adventure hero, but it could be quite intriguing, especially along with Indy’s new stance at a family man. Think about it! Maybe Indy has settled down. He gets up in the morning, reads the paper, drinks his coffee and dreams of the old days, fighting Nazis and discovering relics. At this point in his life, he himself belongs in a museum. But just then, something happens and legendary archeologist, Indiana Jones, who has a wife and family, has to set those important things aside to save the world one more time. Obviously, this is all speculation but the interesting place Crystal Skull left Indy does mean the new film could explore some very ripe material. The nature of what it means to be an aging hero. How do you deal with the fact your best years are behind you? Balancing the love of your family with having to do what’s right? And, potentially, passing the whip and fedora down, be it to your son... or someone else. In the coming years, lots and lots will be written about Indiana Jones and the Kingdom of the Crystal Skull, what it means for Indiana Jones 5, and what’s going to happen in that movie. And while many of our memories of Crystal Skull aren’t particularly positive, it still could be a jumping-off point for something great.